Daisy Ridley recently sat down for an interview where she talked about Porgs, and more importantly, she spoke about Supreme Leader Snoke and Rey in Star Wars: The Last Jedi. Ever since the proper trailer for the highly anticipated Star Wars movie dropped last month, fans have been speculating about the scene including Rey and Snoke. In the new interview, Ridley reveals that Snoke is a "test" for Rey. This could be like the way that Palpatine also "tested" Anakin, forcing him to murder the Jedi Order to prove his loyalty to the Supreme Chancellor. 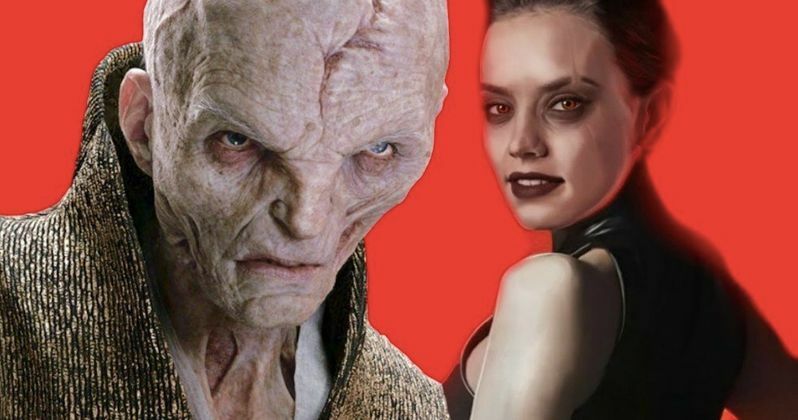 Daisy Ridley spoke about how evil Snoke is in a new interview with USA Today. She also hinted that he may not be human, nor a man, which has been speculated for months, due to his height and his weird choice of space clothing. Ridley had this to say. "He looks mental. Snoke is an evil guy, if you can call him a guy." In addition, the actress spoke about her time on the set working on the now infamous scene that is shown in all of The Last Jedi footage that has been popping up. Snoke appears to be torturing Rey in the scene and all of the screaming apparently took its toll on Daisy Ridley's voice. She said, "It was painful. My throat hurt after that one." Most importantly, Daisy Ridley reveals that Snoke is a test for Rey. This too has been speculated about for over a month now. Many believe that Snoke is talking to Rey in the latest trailer for The Last Jedi and not Kylo Ren as initially believed. She explains. "Snoke is one of those tests for Rey. And when I say testing, it's the worst use of testing ever." Snoke became very interested in Rey when he learned she was able to fight off Kylo Ren's interrogation methods, possibly seeing her as a more powerful apprentice than the fallen Ben Solo. If Daisy Ridley is referring to Rey's scene with Snoke as "one of those tests," it could be that Snoke is just seeing just how powerful Rey is by putting her through the wringer to determine if she is what he may need. While we're not exactly sure how the two end up meeting in The Last Jedi, it does seem that Luke Skywalker is refusing to train Rey in the ways of the Jedi after being frightened by the power that she wields. This could very well take Rey to seek help from outside professionals, which could in turn be the true test to see if Rey signs up with the First Order. We'll just have to wait and see what Snoke has in store for Rey next month when the movie hits theaters. The Last Jedi director Rian Johnson has said that though we will see more of Supreme Leader Snoke in the upcoming movie, we won't be learning about his backstory. It took decades to learn of Palpatine's backstory, so this could be something that is explored at a later time, perhaps even in the new Star Wars trilogy that Rian Johnson is involved with. Regardless, Snoke and Rey have some "testing" to conduct in The Last Jedi. You can read more about the "testing" as well as some more Daisy Ridley's thoughts on The Last Jedi courtesy of USA Today.